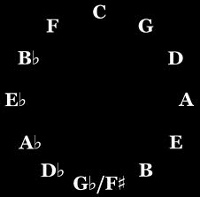 You might be wondering how harmonica keys and positions relate to each other, all the different positions (of which there are 12) follow a simple rule: For each consecutive position the key moves a fifth (7 semitones) above the key of the previous position – following what is know as a circle of fifths. and this holds true for every harp regardless of its key, like in 2nd position, root is always 2 draw – it’s all relative! Just a word of caution, when counting fifths it is tempting to just count five steps of the C major scale, so a C harp in 2nd position would be in the key of C.. D.. E.. F.. G… key of G, yes that’s fine until you get to a B harp, 2nd position and count B.. C.. D.. E.. F.. key of F, which is wrong, 2nd position would actually be F# (or Gb). This happens because you haven’t counted a fifth, since B to F contains only 6 semitones (should be 7 semitones). This is easier to visualize on a keyboard, where as you can see there is always only a semitone between B to C and E to F.
Armed with this information, you should now be able to work out all the 12 positions which correspond to the 12 keys of a chromatic scale. However, unless you’re playing chromatically with overblows you probably won’t need to know all this – many blues players stick to 2nd position most of the time.